More than two years in the making and featuring hundreds of brand new interviews and photographs, Burning Britain is the true story of the UK punk scene from 1980-1984 told for the first time by the bands and labels who created it. Covering the country region by region, Ian Glasper profiles not only big names like Vice Squad, Anti Pasti and The Defects, but also the more obscure bands of the era such as Xtract, Skroteez and Soldier Dolls. 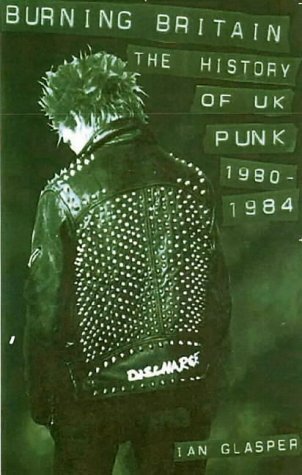 A veteran himself of the UK punk scene (having played bass for Decadence Within, Burnside, Flux Of Pink Indians, Stampin’ Ground, Suicide Watch, and, most recently, Betrayed By Many), Ian Glasper’s trilogy of books about the UK’s turbulent Eighties punk scene are widely regarded as the definitive account of that period. A father of two, who cut his journalistic teeth with the popular Record Collector and Terrorizer magazines, he digs vegetarian food, Brazilian jiu-jitsu and gratuitously violent films, and is currently working on a book about UK punk rock in the Nineties.